I want to share a photo I took yesterday afternoon on my way home from swim lessons. The billboard is advertising Direct.com, a domain name used by a local credit union called Direct Federal Credit Union. I spotted the billboard on I-95 in either Needham or Wellesley, Massachusetts. It was the first time I can recall the name of this credit union before, and I think it is an effective advertisement. The credit union has owned the Direct.com domain name for many years. The earliest historical Whois record from 2001 (courtesy of DomainTools), shows that the credit union owned the domain name back then. The credit union also owns Direct Federal.com. Unfortunately for them, another credit union called Deseret First Credit Union owns the matching DFCU.com domain name. I am sure they are content with their domain names though. 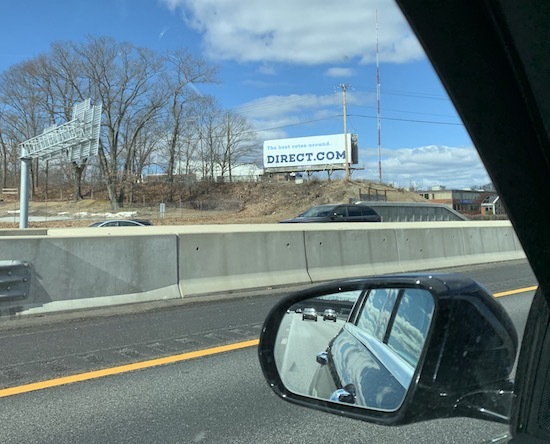 I think Direct.com is a fantastic domain name, and I think this billboard shows how a great domain name can be the focus of a billboard on a major highway. It’s easy to remember, simple to spell, and the messaging is clear. Kudos to Direct Federal Credit Union, which I had no idea existed (essentially in my backyard) until I saw the billboard yesterday. The domain name itself is good, but it’s not brand-matching to its current owner. I saw that one too – I drive that road almost every day. I immediately thought, wow, what a great name and I’ll totally remember that. However, to this day, I still don’t know what the company is or does. Yes, it’s a really great domain, but unless there is a pretty big multi-channel marketing campaign around it associating that brand with a product/service, most people probably won’t remember what the company does. I think you’re over analyzing as a marketer and missing that most people who pass it would assume it refers to mortgage rates. What else could they be advertising other than mortgage rates or maybe insurance rates? Totally can tell what they do by the tag line. I just meant that I don’t see the tagline when I’m driving by at 60+ MPH past that billboard, so I recall the domain, but not at all what they do. Most people won’t remember the tag line (or see it unless stuck in traffic). It’s like seeing a commercial on TV a million times, you can sing the jingle, but don’t know recall the company name or what they are advertising. I can’t say when I hear ‘direct’, the first thing I think of is a credit union. It does make sense, but there are a million things that can be direct. Direct flights is my first association but then DirectTV (brand), direct marketing, etc. It is still a great billboard – it’s all domain name. I’m sure it is driving lots of traffic to their website. I am looking at it through marketing eyes for sure and when I saw it, I started wondering about the ROI on the campaign. It would be a fun case study to do. If the billboard is there to acquire new customers, anyone that sees the billboard will remember the web address. If they see the tag line and are in the market for great rates from a financial institution, they’ll likely get some qualified visitors to their website and gain new customers. It is a great domain, and it definitely passes the ‘billboard’ test. It’s just not intuitive to everyone that Direct is a credit union. Funny thing, I just saw within about a 1 mile radius of that location, there is Direct Tire, Direct Auto, Direct IT (computer services) and Direct Federal Credit Union. Thanks for posting the picture. It’s always fun to have the conversation around domains and marketing! I have to agree. I wouldn’t know the name was associated with a credit union, based on that billboard. It’s an amazing name. 7 figures for sure.